SANTAMONICA STUDY ABROAD (PVT.) LTD.
Santamonica study Abroad Pvt. Ltd. established in the year 2002, with its corporate office based at Kochi, Kerala is one of the most trusted names in the field of overseas education in India with a clear vision of making quality global education accessible to the deserving. It is the authorized representative of 50+ top notch universities/ colleges from 10+ countries, with a wide network of offices and associates throughout India facilitating overseas admissions across diverse streams ranging from Medicine ,Engineering / IT, Management, Hospitality, Nursing / Health care etc Over the past 15+ years we've been successful in identifying the right course and the right institution to match the goals and aspirations of thousands oflndian students and continue to facilitate 1500 -2000 admissions annually . We are privileged to be the authorized British council exam registration centre; Golden member of British council IELTS program and authorized managers of Pearson's Test Center in the state of Kerala, India and among the select Fifteen Education New Zealand recognized members in India (ENZRA) Our exclusive services ranges from Universities/ Colleges short Iisting to application submission, liaising with Universities, visa guidance scholarship assistance, to pre departure and post landing. Malayala Manorama Co Ltd, associate partner of The Santamonica Overseas Education Expo 2019 is one of India’s largest media conglomerate with its flagship being Malayala Manorama, India’s largest circulated regional language newspaper with 18 editions and 20 million readers. The group is present in every existing media platform – Newspapers, Magazines, Books, TV, Radio, music and Internet. 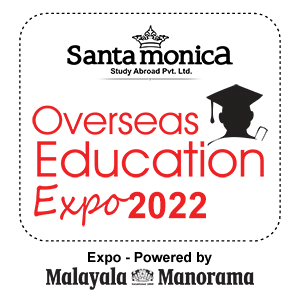 Malayala Manorama’s wide readership constitutes a significant proportion of students and parents who attend the Santamonica Overseas Education Expo.